Pixarra > Categories > Feature Requests > [Resolved] Color Palette, remember the last couple of sets of 4 colors. I use Combo Palettes in all slots for the Color Palette, usually ordered according to the Spectrum (ROYGBIV, Neutral, Unusual color combos, etc.). While these are stored in files, I often make minor changes to one or more of the 4 colors in the Color Adjust Panel, custom to the current palette needs. 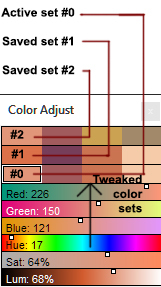 It would be nice to have one or two extra lines to save the most recently used 4-color combos in the Color Adjust Panel, for temporary 4-color combos that have evolved with the painting. Why? Sometime I try out new colors, but it does not work well, and I want to go back to the previous set that was tweaked, and start over with my color choices. I don't always want to save then to a line in the Color Palette panel, since they are usually set to nice starting bases. Please do let me know if there is a more convenient feature in TB for remembering temporary 4-color sets, of which I may be unaware. There are 8 pallets available for use. Could you not just set one for your edited colors? This may have been requested. I know for myself I often have use a Screenshot. used to manually enter color by use of the color picker. Could we double the number of Palettes. That way one could easily create a alternative Palette. That directly correspond to the above Palette. 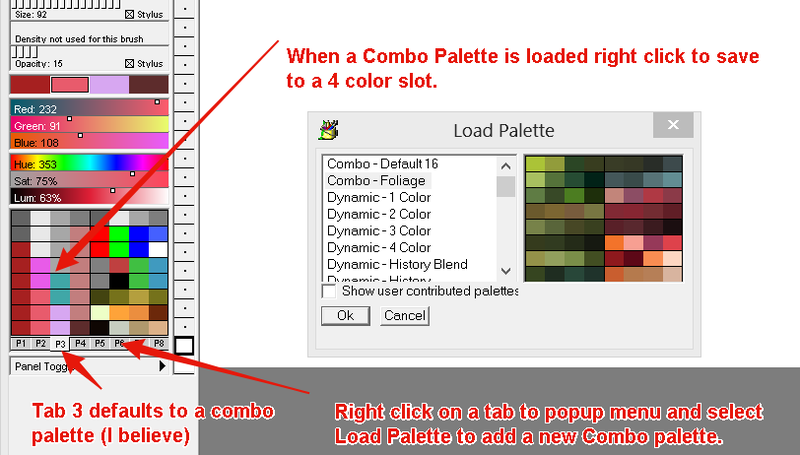 There isn't a automatic 4 color history option, but there are "Combo" palettes and work on four colors at a time. See image below. 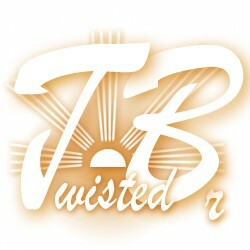 Let us know if this meets your needs. I already have all 8 of the Color Palette pages and slots filled with Combo Palettes. These are my base set. P1 is a collection of analogous Red 4-color selections. P2 is filled with analogous Orange 4-color selections, etc. I have filled these using a right-click. I seldom want to change these. bank turn a Sea of Greens. It was years ago this funtion was to be Ctrl>Click. passes to close to Palette. saving many color combos is to make a Screenshot. Or could we double the Palettes? >..using a right-click. I seldom want to change these. In any case, the mentioned modification keys are superfluous. I'm sure that at one point Right Click Entry was abandoned. I clearly remember asking why Right Click no longer worked. It was your reply that set me straight whit Shift. When did this Right Click Action reappear? At any rate Ctrl Bug must be corrected. Thanks for all of the information! I will take a deeper look over the next couple of days. Perhaps a little known power users trick is to use a brush as a color combo. Take a look at this animated GIF to see how you can setup brushes in your shortcuts panel as temporary combos. If this is playing back too fast take a look at the MP4 version for correct speed and better resolution. 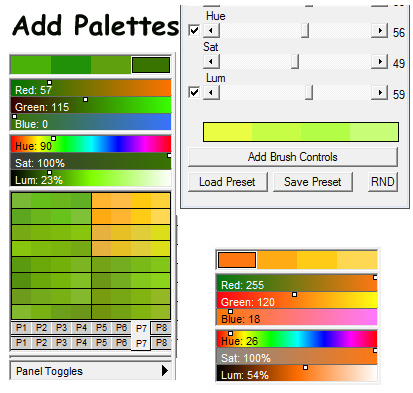 - Right click to pull up the brush menu to select the Edit Brush Options. 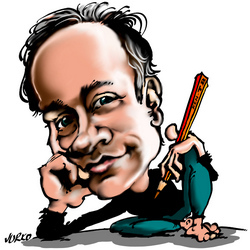 - Shift click to copy a shortcut brush to another slot. - This is a cool solution because the adjusted colors are automatically saved into the combo brush. - Also cool is that when you select a combo brush the previous brush settings are remembered and used as your painting brush. - Of course this extends to having full ArtSets of combos. The pros are that one can really make subtle changes to the 4-color combo and keep them for a time till the Brush Shortcuts are overwritten. It does mean needing to keep on of the P# lists clear. I also admit to being a datahoarder! When one saves the presets for this, after re-reading the documentation once more, may I assume that when saving a preset, ALL of the existing options, parameters, brushes, pallets, shortcuts, panels, etc. are all recorded at the same time into the [user-chosen-name].pre file?